Greek culture and mythology has always been a popular means of inspiration for modern art. The Greek script with its artistic and stylistic qualities is fast gaining popularity in tattoo art. If you have read all the volumes of Ulysses and seen all the historical Greek movies, and want to take your passion for the Greek culture a bit further, it’s only apt that you indulge in some Greek tattoo art. These top ten Greek mythology tattoos should have you inspired enough to get started. This tattoo depicting the Greek flag set in an ornate heart pendant is the perfect example of tattoo art inspired by Greece. Make a note of the attractive shade of blue that is one of the primary colors of the Greek flag and the ornate embellishments that accentuate this tattoo. 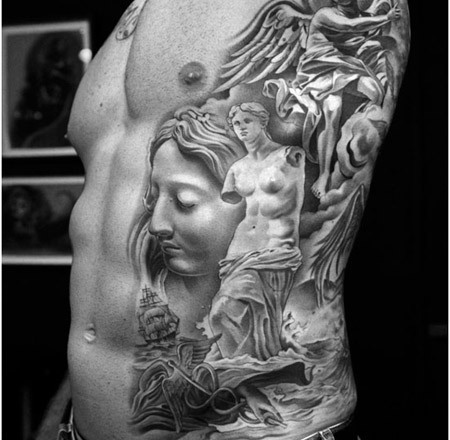 Reminiscent of ancient Greek art and sculpture this mural tattoo is work of art by the ridiculously talented tattoo artist Jim Chua. With clear references to Christian and Greek mythological history, this piece of art is as good as what you would get painted on canvas, set in a frame, at any popular museum across the world. The Greek word “Meraki” means to do something with soul, passion, love and creativity or to put yourself in to whatever you do. 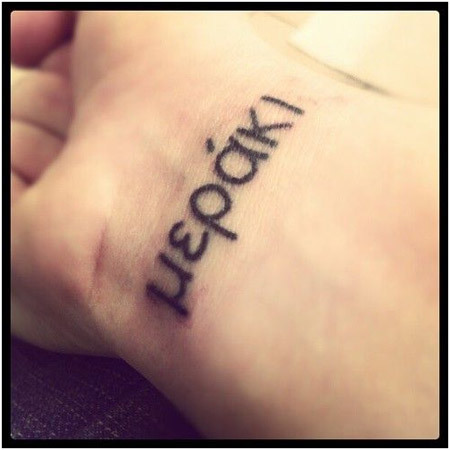 Get this profound Greek word inscribed on your skin. This will inspire you even as you go about your daily routine at work and home with the intention of getting the best results out of your hard labor of love. 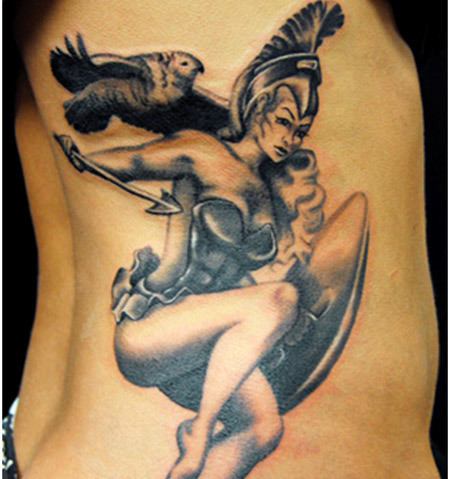 If you are a girl willing to fight to achieve her goals and labor hard in the pursuit of wisdom, let this tattoo depicting the Greek Goddess Athena, the patron Goddess of war and wisdom inspire you. Its best you replicate this piece of art, as it is and only have a seasoned tattoo artist do it for you. This portrayal of Ulysses stands out for its use of black as the only color and its uncanny resemblance to ancient Greek art. This tattoo has a profound dark and mysterious quality to it that is sure to have a few people staring. Not easily replicated, it’s best you consult a seasoned tattoo artist with a printout of this picture. For those who are unaware “agape” is the Greek word for the love between God and man. 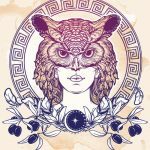 So if you are deeply spiritual and if you would love to be constantly reminded of the bond of love you share with your creator, this Greek mythology tattoo is perfect for you. 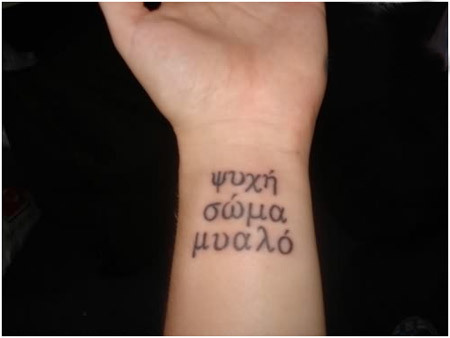 This Greek tattoo simply says “Lust for Life, Lust for Love” and is the perfect extension of your personality. If this is the mantra of your life, however you can also let these profound words inspire you to live a more wholesome life and love the people around you more whole heartedly. 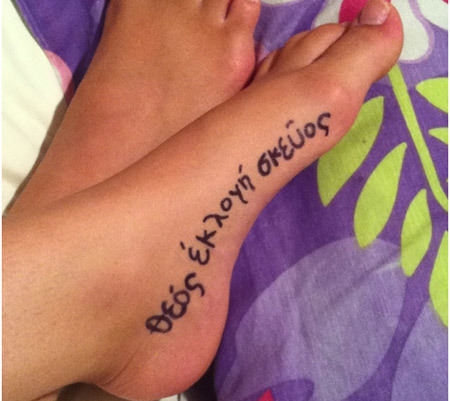 Another profound Greek message for you, this tattoo simply says “Chosen Instrument of God”. This is a verse borrowed from The Holy Bible. This profound message is a universal truth as we all are put on earth for the betterment of our fellow beings according to the divine plan of our creator. 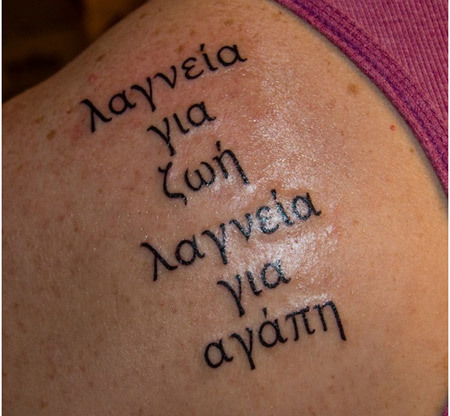 This tattoo is mostly an example of how you can use power words in Greek for tattoo art that is uplifting and inspiring. This tattoo simply says “soul, body and mind”. Use Google translate to help you translate from English to Greek. 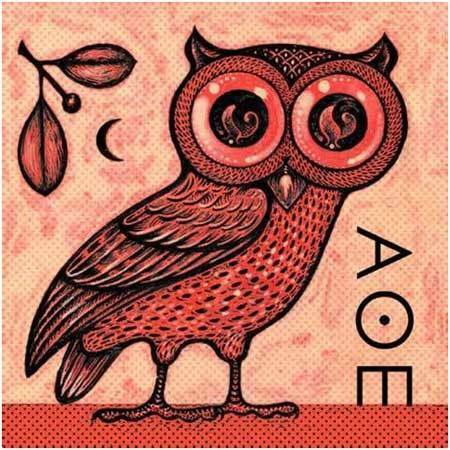 The owl is an important motif in Greek mythology and symbolizes wisdom and goodness. 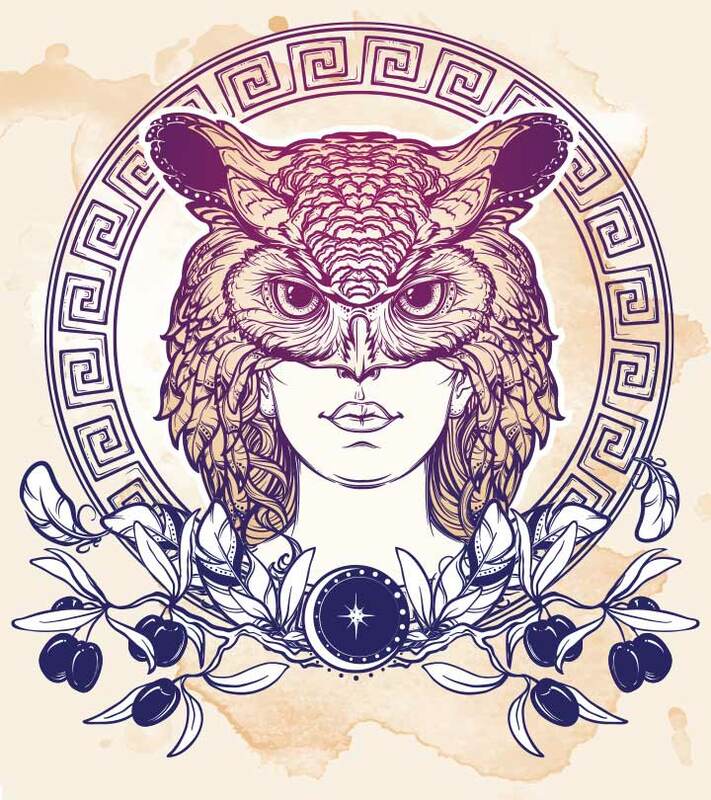 This is mostly an example of how you can use the owl motif for Greece inspired tattoos. 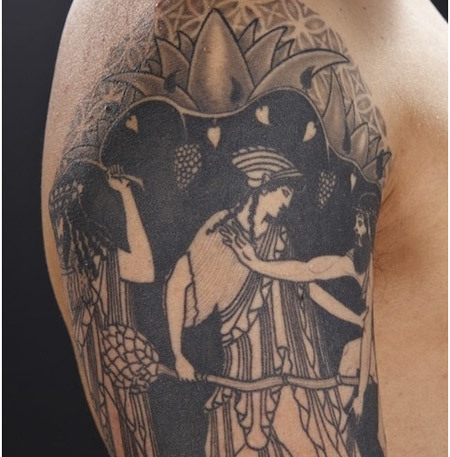 Hope this article on Greek mythology tattoo designs was interesting enough. Do send your feedback on which one is your pick or if you have any more Greek mythology tattoo ideas. 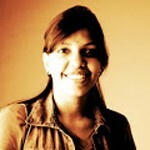 Find a variety of designs in Tattoos For All with over 8000 Tattoo images.